The Active Jersey is our go to for events, bike shops, and clubs - but it is anything but basic. Most entry-level jerseys come in only one fit, but we offer both race and club fit, both with a full hidden camlock zipper. You can also choose a sleeveless version or a relaxed fit with no elastic at the waist. In full sublimation there are no limits to colors or print locations - the possibilities are endless. With the fastest standard delivery and some of the best pricing in the industry this should be your go-to jersey. The Active Jersey is available in Male and Female XXS-4XL, plus Youth S, M, and L.
We were trusted by the organizers of the UCI World Championship in Richmond to handle the production of promotional jerseys. Our Active Jersey handled their complex design with lines crossing seams. The Active Jersey is available in Male and Female fit in sizes XXS-4XL. We also offer Youth S, M, and L.
The Active Race is perfect for a stage race leaders jersey. 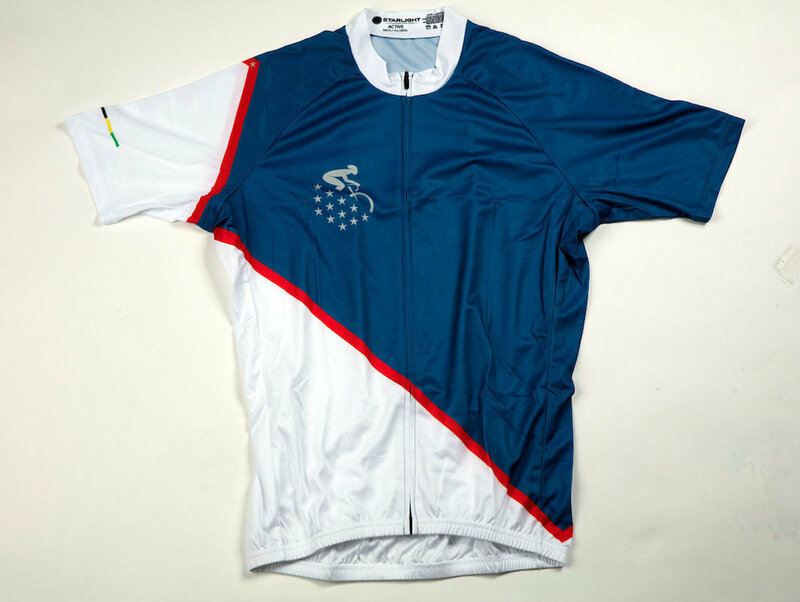 Pictured here is the Pisgah Stage Race leader jersey, which we have provided since 2011.